Use books, easels or pedestals as risers. One of the easiest ways to add interest to bookshelves is to stagger the height of your pieces. 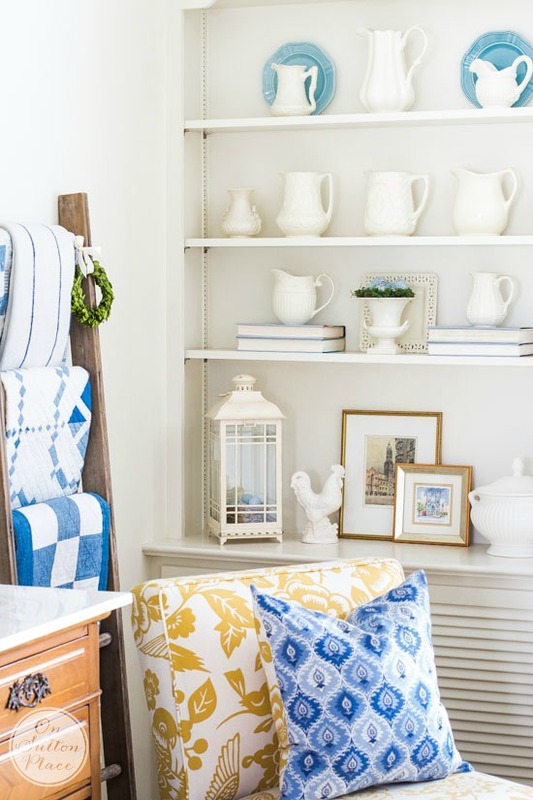 You don’t have to stagger every shelf but it helps to vary the height on one or two shelves. This is a layering technique that comes in handy anywhere. In the pic above, the top and bottom shelves have staggered heights. The middle shelves are somewhat even. I used two stacks of books to raise up two pitchers that would have otherwise been too short. Lean and layer frames, plates or platters for interest. 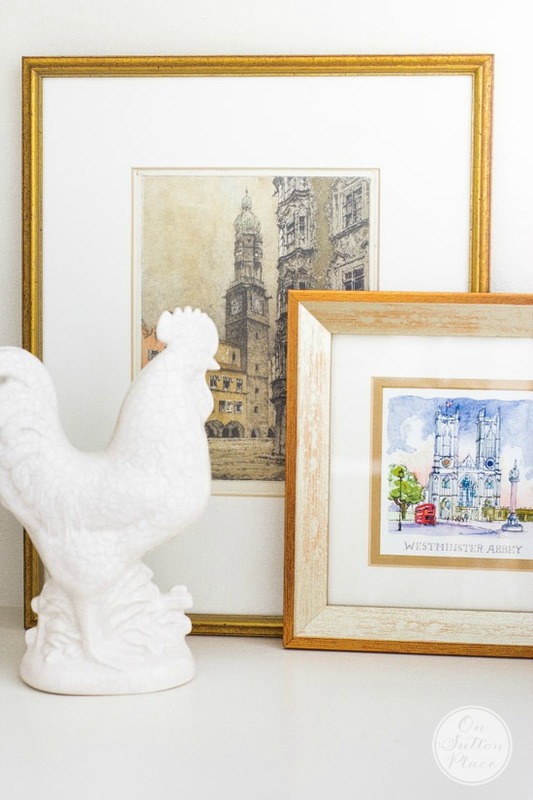 Continuing the idea of staggering heights, it’s fun to lean framed pictures or plates. Again, layer them a little. Place a plate behind a pitcher or layer two frames that are different sizes. It helps to have plate grooves on your shelves which I do not..so if I lean a plate I have to put something in front of it to prevent a crash. Symmetry is when a center point is flanked on either side by identical objects. Symmetry is something that lets your eye rest easily. You don’t need it everywhere, but a little bit here and there pulls your decor together. My two banks of bookshelves flank the big window in our living room. There’s a sofa in front of the window. The bookshelves are identical except for the fact that on the right I added a television. I thought long and hard about this but in the end I knew the room had to be functional and livable. I created symmetry on the top shelves by using like items on both sides. I also repeated the frames on both sides. Even though they are not an exact match, it still works. 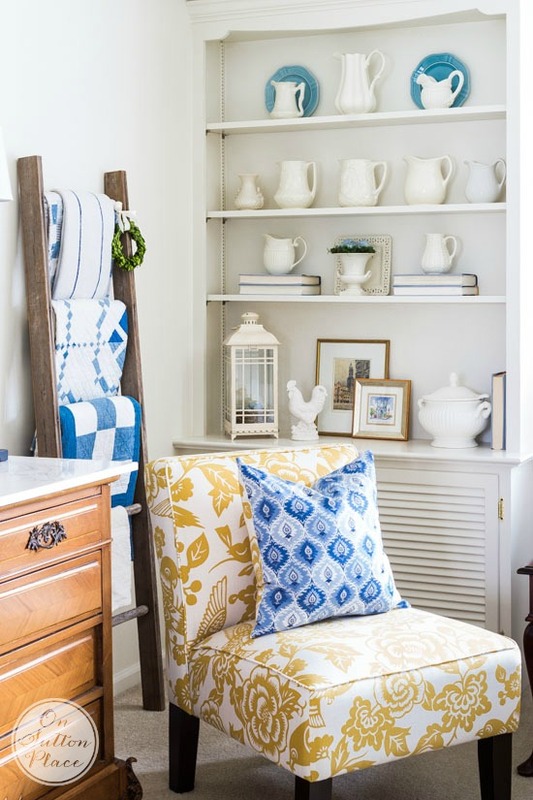 If you are working with just one set of shelves, create your symmetry within by flanking a taller piece with smaller, matching pieces. Stick with two or three colors: a neutral and one or two accent colors. 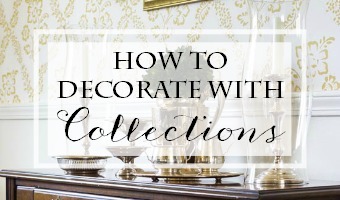 This sort of goes hand-in-hand with decorating with your collections. Whether it be books, family photos, ironstone or anything else, keeping like items together makes a bigger impact. I hope you got a new idea or a little inspiration from your visit today. For those of you who stick around to the end of my posts, I want to chat a minute about the ads on my site. Ad revenue is an unpredictable thing. There is no way to plan ahead because the ad revenue depends on site visitors, pageviews and ad clicks. I am blessed to have my ads managed by an amazing company called AdThrive. They take care of everything for me so all I have to do is create content. They’ve made a few positive changes that hopefully will bring in a little more money and I’m in the beginning phase of trying out the new ads. If things look a bit different, or if ads appear in new places, I hope you understand. I realized a few years ago that I could not depend on ad revenue as my only means of income. I have pursued other options so I am not dependent solely on the ads…however I also feel like I need to take advantage of this opportunity to maximize my earnings. I will not be running the ads that appear on images. I have worked too dang hard on my photography for that! I also declined the wide, sticky ad that runs along the bottom of your screen. Let me know if anything really bugs you or if you get annoyed. I hope that doesn’t happen but if it does, I really want to know. Thanks for hanging in there…see you soon! Click the images below for more inspiration! Great suggestions! I’ve never actually thought about my shelves in that way. I just keep playing till its pleasing. But, I think next time, I’ll try it your way! I may be weird but how would you style a bookcase thats primary use is to store books. I have a small place and special books that I use and want to keep. How would you style that? My sweet friend Beth Fitzpatrick shared your wonderful website with me. Your ideas always inspire me. Thanks for all that you share. Thank you for the great tips and tricks, Ann! I’m interested in your quilt ladder, is it from a retailer or handmade? All great tips Ann and I like how you pointed out the symmetry in the top shelves on both sides, great point. I always enjoy seeing your mix of yellow and blue together it’s so cheery. Thank you for not having ads that cover your post. Those are so irritating! Love your pictures and practical advice! God bless! I have just discovered your blog and found lots to inspire and motivate me. I live in the U.K. and have a particular interest in heritage quilting, that is how,I found you on Pimterest. You are promoted to my desktop now! Thank you for making the effort to improve and enrich our lives. I so love your blog that I don’t really notice the ads! Love your shelves, thanks for the help with ours! You fooled me. When I read what you had written about re-doing your bookshelves I thought for sure when I opened the picture I would find you had painted the back of the shelves…which is a look I love. But I also really like what you did by adding the blue plates; you have not only given color but dimension as well. You are a wise woman. Thanks for not adding those wide ads across the bottom. Nothing irritates me more than those. Well pop up ads are just as bad! Maybe it’s just because I am viewing on my cellphone but I am getting all of those annoying ads that keep popping up as I scroll down to read the posts. My mobile site is a whole different set up than my desktop site. I will ask my ad manager about the pop up ads. I’m sorry…hang in there with me while I try to figure this out. Thank you for telling me! Hi nice post but these ads are so annoying and distracting. Takes away from the blog. Ann, you have such a classy looking blog page! I love reading your posts. You have helped me think “outside the box” when I decorate some of the areas of my home. Thank you for always sharing what you are doing. Your ideas, recipes and lovely home are what i am here for,i just ignore everything else. Have a wonderful day Ann. Ann, Your consideration for your readers is just another reason we love your blog so much!! I, too, have quit reading blogs that are so overloaded with ads that you can’t read or see their photographs. Keep on doing what you are doing—we appreciate your thoughtfulness. I always open your emails and they are a sweet spot in my day——–thanks for your inspiration and kind hospitality. Thou blogs are so fun and interesting that I don’t notice any ads. Thanks and keep doing what you do!!!! Hi Ann, your bookshelves are very clean, bright and pretty! I love the yellows, golds and blues in your living room. Ann, I love your quilts on your ladder. Perfect placement. I did the book pages front at Christmas in a vignette on my coffee table. I enjoy styling my bookcase shelves on the sides of our family room shelves. 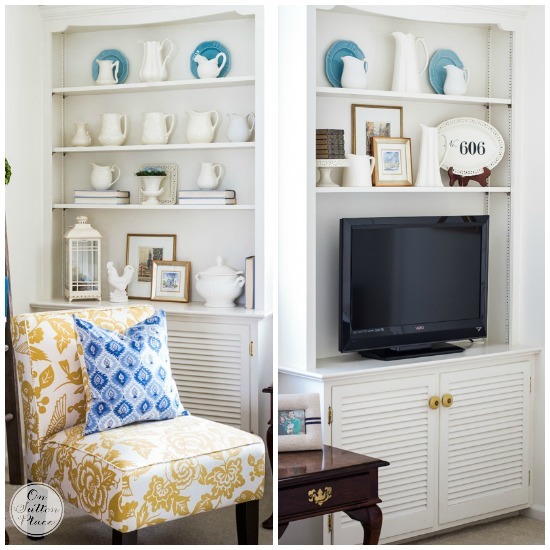 Love to see your family room shelves again. They made that room so updated. I too agree that some blogs are difficult to read with their video adds. I may stop several, but they are quite inspirational, so I will give them a little more time to listen to their readers. Thank you, thank you, thank you for not using those types of ads! Those both annoy me to no end! Thanks for sharing your home! The shelves look great. Thanks for the tips. Love your ideas! Any thoughts on coffee tables? Your tips are so helpful and I can see how I can make one of my shelving units look better. I like the way you added a touch of blue which gave it a touch of winter, very pretty. I would love to do away with the TV in our living room, but that will never happen. 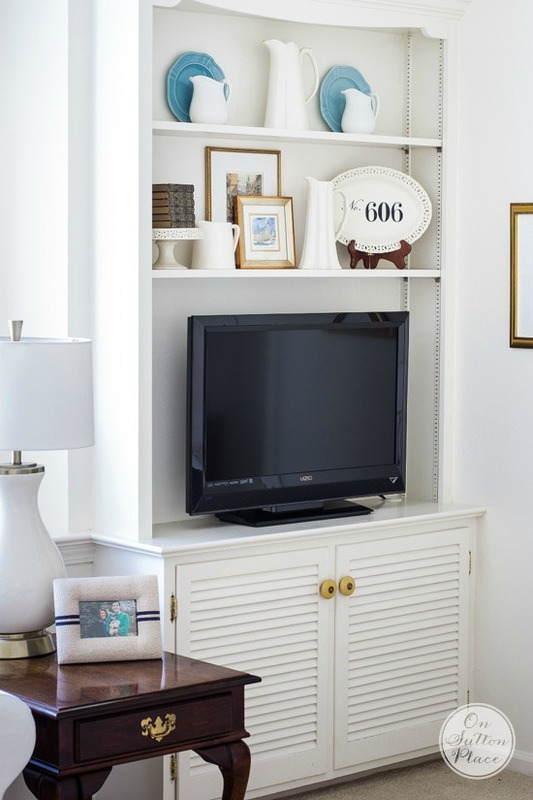 After seeing how your built in is made it gave me an idea to have someone build one a corner cabinet, that way we can have it at the right height and I can have more storage and display, and when we are not watching TV we can close the doors. TV’s are great, but they sure create decorating problems. Thank you for the tips. I must say , your blog is the one blog where the adds don’t bother me, I actually look at them. I got my mini bundt cake pan, and tried your mini angel food cake, and they were so good and I love that pan, Thanks so much. In a perfect blog world there would be no ads, but that isn’t reality. Blogs that are “throwing up” adds are frustrating to read and my time is too valuable to spend it wading thru too many “commercials.” That being said, I so appreciate your wanting input on your site and ad placement. I am not at all overwhelmed by your ads. Your post content shines and your commitment to your readers shines. I am new to your site and enjoying both the content and the ad layout. I think you have a perfect balance here and I look forward to visiting again. Your shelves look great! Love the bits of blue. Ann, I really appreciate your shelf styling help. This is my major weakness in home decorating, and I’ve tried for years to emulate the ones I admire. Your direct and clear advice makes it sooo simpl and I now feel confident enough to tackle my Achille’s heel. As for the ad content, I love that the ads that appear on your site are situated so as not to constantly distract and overlay the content. I’d actually noticed that before today’s explanation. Kudo’s to you! 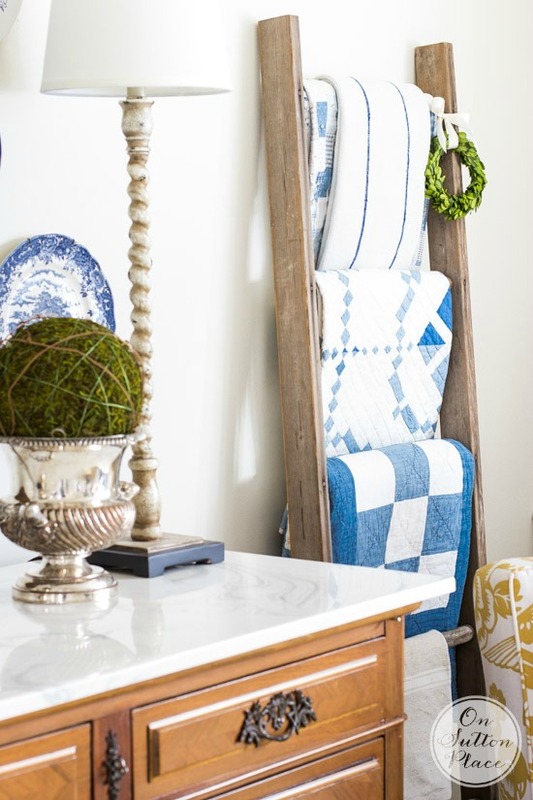 I get a sense of calm, a sense of clean and crisp when I view your home styling. 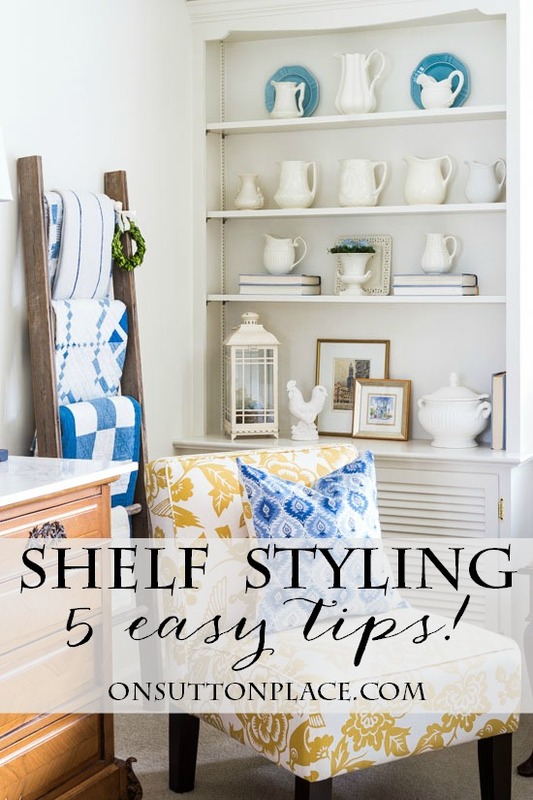 There will never be too many posts on shelve styling!! All of this, just beautiful. Thank you. I completely agree with Carol and have stopped following certain blogs due to advertisements which get in the way and interrupt while you are “reading for meaning”.. Thank you for being considerate of your readers, it’s one of the reasons we follow you. 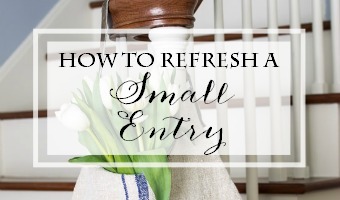 Your attention to detail and your welcoming ways certainly make your blog special. Thanks again for creating a welcoming retreat. 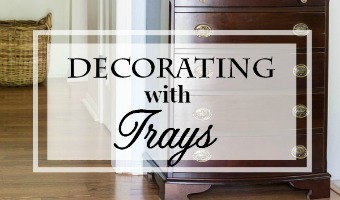 Thank you for a great blog, I appreciate your decorating tips and the printables you design. Thank you so much for your consideration with the ads. I understand they are necessary but the annoying ones on photos and along the bottom usually are so frustrating that I don’t read the blog. Great post and ideas. Your site is awesome! Thank you for taking your readers into consideration with the placement of the ads on your site. While I understand that this is a business for you and others when ads get in the way of content it is extremely frustrating. I have quit following/reading blogs due to all the ads. Once again thanks for the beautiful pictures and wonderful writing (and almost ad free site). Thanks Carol! I totally understand. I have gone to blogs that take so long to load that my computer freezes. No one needs that kind of frustration. I hope this is a positive change for all of us! You are so right about computer freezing. I have unsubscribed to several that do that. Your ad placement is curteous and appreciated. And you content is welcoming and helpful. Keep up the great work. I love your new winter look- very cozy and inviting! The ‘backward books’ is a great idea and I agree that they add texture without clashing colors. Thank you for your thoughtful consideration of your readers in regards to ads. Yours are just right and not obtrusive at all. Your ads are just right and not bothersome at all. Thanks for the decorating tips!